If an international inquiry into the chemical attack in Syria's Idlib is not instituted, it will mean that the international community is not interested in establishing the truth about the matter, Russian Foreign Minister Sergey Lavrov said after talks with his US counterpart in Moscow. “I would like to stress that we are 100 percent sure that, if our colleagues in the UN or in The Hague will steer away from this investigation, it will basically mean that they do not want to find out the truth,” the Russian Foreign Minister said, adding, that Russia “will insist on” launching the investigation. At the same time, Lavrov the official noted that Moscow that Washington is ready to support the idea of launching an international inquiry into the alleged chemical weapons attack in Idlib. He also stressedthat any UN Security Council resolution that focused on solely blaming Damascus and not on investigating the Idlib incident would be counterproductive. “The perspective from the US supported by the facts that we have are conclusive that the chemical weapons attack carried out in Syria was planned, directed and executed by the Syrian regime forces and we are quite confident of that,” the top US diplomat stated. The Russian Foreign Minister went on to say that President Vladimir Putin is ready to return to implementing the memorandum of understanding on flight safety in Syria with the United States; if Washington reaffirms its commitment to the goal of fighting terrorism. 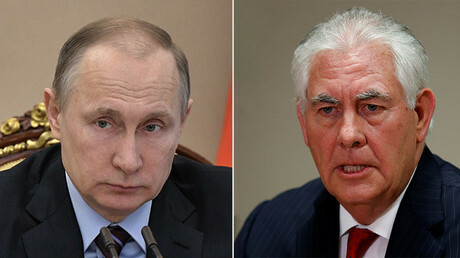 Tillerson said the issue of sanctions was not raised during his discussions with Lavrov, but noted that the US is "mindful" of the seriousness of ’Russian interference’ in the US elections. “As for the question of the interference with the elections, it is fairly well established. We are mindful of the seriousness of that particular interference into our elections and I am sure that Russia is mindful of it as well,” the US Secretary of State said. He also addressed that situation in Ukraine by saying that the lack of progress in resolving the Ukrainian crisis could become another hurdle in bilateral relations between the US and Russia. “Until full progress is made under the Minsk Accords, the situation in Ukraine will remain an obstacle to improvement in relations between the US and Russia,” Tillerson said. Lavrov countered, saying, as in case of the alleged chemical attack in Idlib, no solid evidence was ever presented to the public to back up the claim. The Russian Foreign Minister also noted that Moscow believes there are attempts to hamper cooperation between Russia and the US and to increase tensions between the two countries, adding that it is a “shortsighted” approach. The two diplomats emphasized that Moscow and Washington are planning to work on improving bilateral relations and announced the creation of a joint expert group tasked with analyzing the situation and addressing sources of mutual concern. 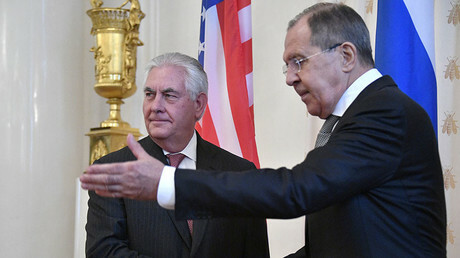 “We agreed to designate special representatives from both the Russian Foreign Ministry and the US department of State to extensively [analyze] those sources of mutual concern that arose in our relations over the recent years… without any emotions or deliberate animosity,” Lavrov said. The data which, according to the US, “purports to be evidence” is “very flimsy” and “relies on mainly open source materials, by which they [the US] mean evidence from jihadi sources, evidence from al Nusra [Front] and what they called the social media,” the former British ambassador to Syria, Peter Ford, told RT, commenting on discussions between Tillerson and Lavrov.